Chalcedony is one of the cryptocrystalline—a term which refers to a structure that consists of tiny crystals that can be seen only at high magnification—varieties of the mineral quartz. It may be semitransparent or translucent and has a waxy luster. It is usually white to gray, grayish-blue or some shade of brown, sometimes nearly black. Other shades have been given different names. A clear red or reddish brown variety is known as carnelian (also spelled cornelian) or sard (colored with iron oxide); a green variety (colored by nickel oxide) is called chrysoprase. Prase is a dull green form, and onyx is black and white banded. Plasma is a bright to emerald-green chalcedony that is sometimes found with small spots of jasper resembling blood drops—the latter form is referred to as bloodstone or heliotrope. Flint is also a variety of chalcedony. Given its abundance and durability, chalcedony was among the earliest raw materials used in human history. It was used to make various tools, weapons, and containers, including cups and bowls. Over time, as its practical functions were replaced by other materials, chalcedony came to be used more as an ornamental stone. 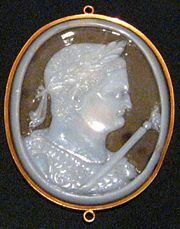 Chalcedony cameo of Titus head, second century C.E. The term chalcedony is derived from the name of the ancient Greek town Chalkedon in Asia Minor, in modern English usually spelled Chalcedon, today the Kadıköy district of Istanbul. People living along the Central Asian trade routes used various forms of chalcedony, including carnelian, to carve intaglios, ring bezels (the upper faceted portion of a gem projecting from the ring setting), and beads that show strong Graeco-Roman influence. Fine examples of first-century objects made from chalcedony, possibly Kushan, were found recently at Tillya-tepe in northwestern Afghanistan. Hot wax would not stick to it, so it was often used to make seal impressions. Chalcedony is more soluble than quartz under low-temperature conditions. The technique of crystallography shows that the crystalline structure of chalcedony is identical to that of quartz, leading one to expect that they should have the same solubility as well. Chalcedony, however, is composed of extremely fine-grained crystals (described as cryptocrystalline), and it therefore has a very high surface area-to-volume ratio. It is believed that this property of chalcedony is responsible for its higher solubility. Onyx is a banded variety of chalcedony. The colors of its bands range from black to white to include almost every color. Commonly, specimens of onyx available contain hues of white, tan, and brown. 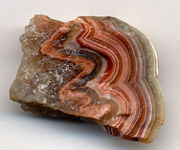 Sardonyx is a variant in which the colored bands are sard (shades of red) rather than black. The agate-like sardonyx (banded agate). The specimen is one inch (2.5 centimeters) wide. It is usually cut as a cabochon, or into beads, and is also used for intaglios and cameos, where the bands make the image contrast with the ground. Some onyx is natural but much is produced by the staining of agate. One can view a close variant of this material in Saint Mary's Church at Żebbuġ, Gozo. According to Rebbenu Bachya, the word Shoham in the verse Exodus 28:20 means "Onyx" and was the stone on the Ephod representing the Tribe of Joseph. There were also two Shoham stones on the shoulders of the Ephod. In the Dreamlands, a fictional location in the works of the author H. P. Lovecraft, the palaces of Kadath are built of onyx. ↑ Jolyon & Ida RalphMindat website, "Onyx" Retrieved October 17, 2007. This page was last modified on 25 January 2017, at 16:27.